Even if the Lemon Law does not apply in your case, many other state and federal laws may protect you. These include laws that require truth-in-lending, prohibit deceptive practices and mandate that vehicles meet minimum safety standards. Most consumer laws provide for you to receive at least a refund and your attorney’s fees. The Warranty Act protects you during the entire period that the factory warranty is in effect. (Based on a 2002 court case, the Warranty Act doesn’t apply to autos with optional extended service contracts.) If you buy a car with a five-year manufacturer’s warranty, then you are protected for at least five years. This protection period can even be extended, because the time limit in which to bring a legal action for breach of warranty is four years from when the defect is first discovered. For example, if you discover that your vehicle is defective four years into a five-year warranty, you have an additional four years (or eight years from the date of purchase) to take legal action. If your vehicle is determined to be a lemon, you have the right to choose a refund instead of a replacement vehicle. You cannot be required by the manufacturer to accept a replacement vehicle instead of a refund. In addition, you may be able to get a refund for repairs, towing and use of a rental vehicle. The Warranty Act also applies to used vehicles that are still under a manufacturer’s new car warranty. When a used car covered by a new car warranty is sold, any remaining time left in the warranty protects the car’s new owner. The law also covers resold lemons (defective vehicles that are bought back by manufacturers or dealers and then resold). By California law, the first time a lemon buyback is resold at the retail level, it must have a one-year factory warranty to cover defects and cannot legally be sold “as is.” The law requires that the car’s title state that it is a “lemon law buyback” and the car must have a “lemon” sticker on the door. Even when lemon buybacks are illegally sold “as is,” the buyer still has rights under the Lemon Law. To document your case, write a letter to the manufacturer outlining the problems you’ve had with the vehicle. Ask the manufacturer to “buy back” your car because it is a lemon. Send the letter by certified mail, return receipt requested, to the manufacturer’s address published in your vehicle owner’s manual. (Since January 2001, manufacturers are required to provide the address clearly and conspicuously in all new owner’s manuals.) Even if the manufacturer has a customer service number, don’t waste time by calling, because a letter is required to document your case. The manufacturer may decide to voluntarily buy your lemon back without any further action on your part. If the manufacturer gives you a hard time about buying back the lemon vehicle, you can hire an attorney or use the manufacturer’s arbitration program, if it has one. Some manufacturers offer “arbitration” programs to resolve lemon law disputes. However, they pay for that process, and it tends to be biased in favor of the manufacturer. The arbitrators are not required to apply the law, and often ignore it. Consumer groups recommend that before you attempt to resolve a dispute in arbitration, you first contact an experienced lemon law attorney for advice. The National Association of Consumer Advocates (NACA) provides information about how to find a lemon law attorney, and NACA members usually provide an initial consultation at no charge to the consumer. If you decide to give arbitration a try despite the fact that it tends to be biased in favor of the manufacturer, you can check if the manufacturer has an arbitration program by looking in your owner’s manual or calling the state Department of Consumer Affairs hotline at 800-952-5210. If you want to use arbitration, call to ask for an application form and a copy of the arbitration program’s rules so you will understand the process that will be used in deciding your case. To improve your odds of winning in arbitration, gather all documents that can help prove your case—your warranty, repair orders, reports of inspections and technical service bulletins. Make copies and submit them to the arbitration panel. The arbitration program must give you a hearing date within 40 days. However, many people experience delays. If your case is delayed, file a complaint with the Department of Consumer Affairs. The manufacturer is not allowed to charge you to use their arbitration process. But you may incur travel expenses, and it could be difficult or costly to get a defective vehicle to the location where the arbitration takes place to have it inspected. It is a good idea to go to the hearing to present your side. You may accept or reject the program’s decision. If you accept, the manufacturer is bound by the decision and has 30 days to comply. However, some people have experienced lengthy delays, such as manufacturers taking a year or more to issue a refund check, or other problems, such as manufacturers deducting for mileage not allowed under the Lemon Law. There is no appeals process for the manufacturer. Don’t give up if you lose in arbitration—you may still go to court to sue for a replacement or refund, and most lemon law cases are settled in the consumer’s favor. But the results of arbitration can be used against you in court, and some lemon law attorneys will not take a case if you have already lost in arbitration. If the manufacturer does not have a certified arbitration program, or you prefer to pursue your lemon law rights in court, you can file a lawsuit. In this case, you will need to hire an attorney. If you win, you are entitled to be reimbursed for your attorney’s fees, however many attorneys work on a “contingency” basis, which means you don’t have to pay your legal fees up front. It is best to hire an attorney who is familiar with lemon law disputes or consumer warranty law, as well as one who represents only consumers—not auto companies. Often, all it takes is a letter from an experienced lemon law attorney to get the manufacturer’s attention and get the case resolved quickly. In California, most lemon lawsuits are settled promptly, with consumers receiving a refund and reimbursement for their attorney’s fees. Any defect or condition that substantially impairs the use, value or safety of your vehicle under warranty, and that you have tried to have an authorized dealer repair, entitles you to seek a refund or replacement under the Lemon Law. This is true even if the manufacturer continues to say it cannot find a problem. The law recognizes that if you purchased a new vehicle or a used one with a factory warranty still in force, you have the right to rely on its dependability and safety. Under the Lemon Law presumption, your vehicle is “presumed” to be a lemon if significant problems have occurred during the first 18 months or within the first 18,000 miles, whichever comes first. But this is only a guideline to help consumers judge what they are dealing with—many lemons show signs of trouble within this time frame. It’s important to know that your vehicle may well qualify for repurchase or replacement if significant defects show up at any time within the warranty period or within the warranty’s mileage cap. Check your warranty and owner’s manual for instructions on how to report your vehicle’s problem. As mentioned earlier, protect yourself by writing to the manufacturer at the specific address shown in the owner’s manual. Keep careful notes about any phone conversations with the manufacturer or its agents and save all work orders, repair receipts and correspondence, including emails. Insist on always getting a work order from the dealership whenever you present the vehicle for repairs—even if the dealer fails to diagnose the problem or attempt a repair. Your vehicle has a problem that is likely to cause death or serious bodily injury, and you provided the dealer with two or more opportunities to repair the problem—even if the dealer failed to diagnose the problem or attempt a repair. Just as the Lemon Law presumption guidelines may be subject to interpretation by a judge or arbitrator, they also can be challenged and perhaps proven not to be true. If the manufacturer can prove that it has not had a reasonable opportunity to repair your car, you may not be entitled to a refund or a replacement vehicle. Or, for example, if the manufacturer can prove that you abused the car, damaged it in an accident or made an alteration to the vehicle that voided the warranty, the Lemon Law may not help you. 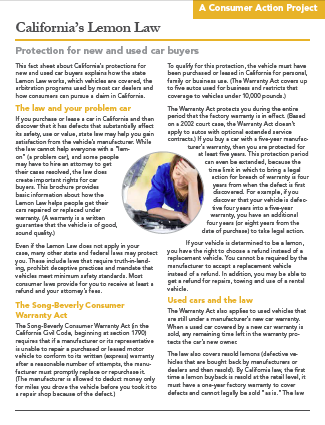 Consumers for Auto Reliability and Safety (CARS) provides information about California’s Lemon Law on its website. For assistance and referrals, call 530-759-9440. The Center for Auto Safety provides information about lemon laws in other states. It also provides attorney referrals on its website or at 202-328-7700. Consumer Action provides consumer advice and referrals. Call 415-777-9635; leave a message and a counselor will call you back. Chinese, English and Spanish are spoken. The National Association of Consumer Advocates allows consumers to search its database of member attorneys across the country by expertise. The California Department of Consumer Affairs’ Arbitration Certification Program certifies and monitors third-party arbitration programs of automobile manufacturers. Note: This fact sheet gives general information, not legal advice. If you have a lemon vehicle, talk to an attorney about how the law applies to your problem.